Wonderfully fun nautical artwork by Tom Cantrell on the country-of-origin first-year-of-release UK Quad for. One of the rarest Carry On titles, highly collectible. Professionally cleaned, de-acidified and linen-backed. 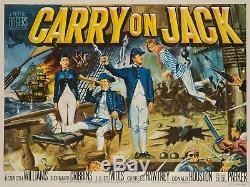 The item "Original Carry On Jack, UK Quad, Film/Movie Poster 1963" is in sale since Thursday, September 6, 2018. This item is in the category "DVDs, Films & TV\Film Memorabilia\Posters\Originals - UK Quads\Pre-1970". The seller is "orsonandwelles" and is located in Bath.